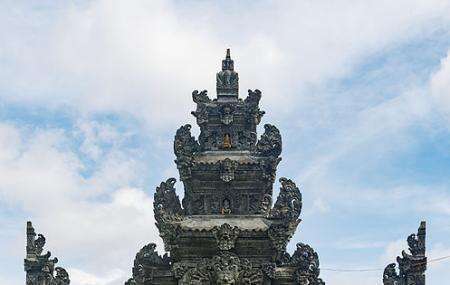 It is one of the most popular state temples in the city dedicated to the supreme god Sanghyang Widi. The temple was built in 1953 and highly reflects the principles of monotheism. Don’t get us wrong, there are various Balinese deities that are worshipped here, but the influence of one precedes the rest. The supreme God that reflects the principle of Pancasila that is ‘Belief in One God’. Apart from spiritual idealism, there is another thing that makes this place super attractive and that is its architecture. The temple shrine, also known as Padmasana, is a stunning piece of creation with its white corals, cosmic turtle and nagas. Even the walls are carved in beautiful pictures depicting the scenes from Ramayana and Mahabharata. Every nook of the building symbolizes one or another aspect of life. If you wish to experience the Balinese faith up and close, this is the perfect place for it. Use Bali trip planner to visit Pura Jagatnatha and many others to your visit. Hotels like Yulia Village Inn Ubud, Bije Sari Suite Bisma, Batu Empug Ubud and Gatra Ubud Inn will solve your problem of where to stay in Bali. Beautiful temple, make sure you will wear long trousers and cover your shoulders! Large and beautiful Hindu temple. Relax and praying.. 100% recommend visit.